"This is a recipe I put together one evening after a long day at school and work, and it's really quite good. I have made it for years, and everyone who has ever tried it has asked for seconds...more Chicken Easy Delight, please! It should make everyone smile - it is so different, and really is good!" In a medium saucepan over low heat combine the raisins, peanuts, honey, mustard, syrup and butter; stir all together until a medium thick glaze has formed, then leave on burner to cook slowly. Stir occasionally to keep from burning. 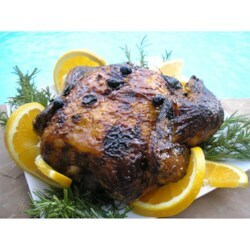 Bake hen at 375 degrees F (190 degrees C) for about 1 hour or until bird is cooked through and juices run clear. Baste hen thoroughly with prepared glaze every 10 to 15 minutes while baking; when hen is cooked through and ready to serve, garnish with orange zest. my family did not really care for this one. Wondeful taste! Kids loved it! This was easy. Smelled great! Tasted ok...my family liked it.. So easy, and love that it uses readily available ingredients. Not too sweet.